I’m from Paw Paw, Michigan, and I had an awesome childhood. Without technology or facebook or even much of a town to do things in, I did crazy childhood stuff like play outside all the time, swim, climb things, “build” things and plot…lots of plotting about what I was going to swim, climb or build. I loved every minute of it. As I got to 5th grade, I started to do a lot more “thinking”. I felt a larger sense of competition than years past, and I began to contemplate how I could be better than others and what my future was going to look like. As a side hobby, I also did substantial planning of my future marriage to Ricky Schroeder, Jeffrey Njus (now a Catholic Priest), Bryn Martin (good at drawing animals from Australia), or unknown faceless boy who flew planes. All of that was great, BUT I do have one regret in my life and occasionally it wakes me up from a sound sleep. It is something I wish I could go back and change from my thoughtful and awesome 5th grade year. Fifth grade was a great year for a Paw Paw Elementary School child because you were the top of the school (as far as grade) and thus, the oldest and coolest kids attending. You were practically an adult at the tender age of 10. It was extra exciting for me because of the impending 5th grade musical which was co-directed by our teacher and the music teacher. Normally, school plays were directed by just the teacher, but ours would have an actual musical professional overseeing the event, oh happy day! I was extremely elated to learn that our musical would be Cinderella. Of course, I would be Cinderella; I was the only one who had previous theater experience. I was “Indian #3” in Peter Pan and “Happy” in Snow White in the local community theater. Compared to that, the 5th grade musical was small potatoes for me. Yes, this was a competition for the role of Cinderella, but the role was mine, and I would not lose. We had to memorize lines for the roles we wanted and also sing a song of our choice. The music teacher taught us a few of the songs from the play and encouraged us to audition with one of those songs. Here’s where things went terribly wrong. You see, I had a few things going against me in my campaign for Cinderella: (1) I looked like a boy and had been called a boy numerous times accidentally. I had boy short hair since my mother wanted to ruin me for all eternity and constantly cut it short. (Important side note: I haven’t had short hair since I gained totalitarian control of my hair’s destiny). (2) I was not cute or small or blonde or princess-looking (in the traditional sense). (3) I would undoubtedly be much taller than prince charming (unless they were going to cast a seventh grader in the role). On the other hand, Allison Smith was all of the things I was not. She was also a lot smarter and nicer than me, which would score bonus points with the teachers. She was my major competition, and I knew it. I had a dilemma, and I wasn’t quite sure how to level the playing field between Allison and me. I wasn’t going to shrink or let my hair grow out in time. I could try to be nicer or sweeter, but I wasn’t sure how to do that either. To guarantee that I would at least have a lead role in the performance, I decided I would audition for the roles of step-mother and step-sister as well, just as a plan b. However, I really really wanted to be Cinderella. I should BE Cinderella, but how? After much thought, I came up with my brilliant idea…an original song. Throughout childhood, I had composed many a song while being grounded or sent to my room. Most of these songs had a similar tune that did not sound like any song ever written. They lacked something major in their delivery, probably the melody. These songs were themed around how much my family hated me and wanted to keep me down from being the best I could be. I didn’t think any of those would do in this particular situation. Finally, I found a poem in our 5th grade reader and decided to put it to music. I couldn’t exactly write music and there wasn’t sheet music to give the teacher, so not only did I audition with an original song (where I stole the lyrics), I sang it a capella. It was a disaster. Everyone was confused and unimpressed with my musical prowess. Allison Smith, however, sang a lovely rendition of “In My Own Little Corner” which brought the house down. I instantly knew my plan was a failure. My one chance to be a princess was gone. I wouldn’t get to wear the pretty dress or dance with prince charming (a boy). I would not be the pretty girl; I would be the not-so-pretty, wicked stepsister. My heart was broken. The only thing I was left with was my mother-mandated short hair and the memories of random strangers mistakenly referring to me as a boy. I was cast as Anastasia, one of the wicked stepsisters. I kicked myself mentally every day for doing that original song. If I had just done the song everyone else did, maybe I would have become a beauty queen or learned how to apply eye makeup or braid hair. A turning point in my life, I’d say, to go the path of the very girly princess or the path of the ugly step-sister? 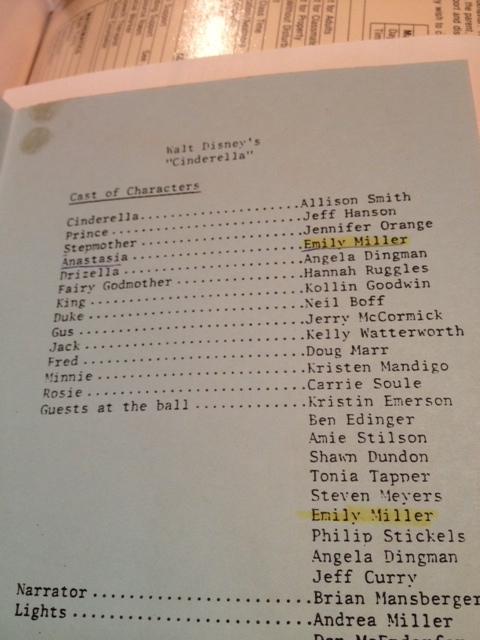 Later, at age 15, I was in Cinderella again in the community theater. I only auditioned for step-sister and stepmother roles. I had no desire to be Cinderella; I wanted to be evil. I did not care about dancing with the boys or singing melodic ballads. I wanted to be hilarious and the villain. The dark side had won. I was cast as the wicked stepmother and enjoyed every minute of it. “Your true calling” my mother would say. So, there it is, my one big regret. I haven’t tried to write an original song since then, and I’ve never auditioned or been cast as the princess, ever. I often look back and wonder if I would have been better at hair styling, applying makeup, wearing dresses, or “being a girl” had I started a princess career early on. Sometimes, I feel pressure to do a better job. That’s when I wake up in the middle of the night panicked, thinking of my one regret. Then I remember I am only a little evil. I no longer have short hair and no one has called be a boy in a very long time. I am successful in an industry dominated by men, not princesses and oddly enough, I actually married that unknown faceless boy who flies planes. I usually fall right back asleep. For the record, my grandmother kept this program and highlighted my name and yes, that is a bow tie. and you ROCKED that bowtie! Here’s to all the little girls who didn’t become princesses…I never was, my daughter doesn’t seem to be, and I think we’ll be just fine. Dad and I read your piece and laughed until we cried. Sorry about the hair. You refused to go to the beauty parlor, so I cut it. Guess my training as an English teacher didn’t translate that we’ll to cosmetology. Never forget, though, your father has ALWAYS referred to you as his “little princess”. Good job! This is one of the best things I’ve read in a long time! Love th bowtie! You were the best stepsister! People thought I was a boy too! Great essay, dad! I love this. And I love your mom’s comment. Also, you are your own woman and that’s why people love you. Hey….could be worse…..before your name it could say “lights” like it does in front of mine. Double sigh. You clearly can’t have a production without lights! Very important! Just last year when I was in grade eleven my school did Cinderella as our annual musical, and I went through the same thing you did! I wanted to be Cinderella so badly but ended up being a step sister. And I tell you it was WAY more fun being ugly and mean than sweet and kind. Agreed. I’m so over the princess-life!